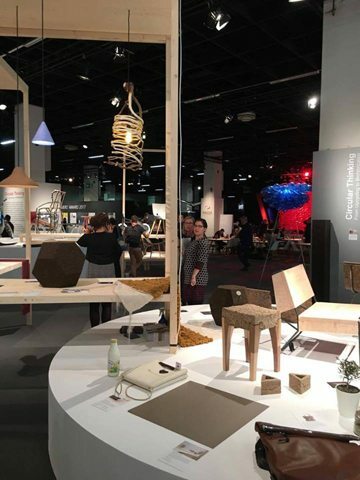 Another big event for Gavin, as he was asked to both exhibit and speak at one of the world’s largest fairs for furniture production and interior design, Interzum, held in Cologne, Germany. As part of the “Circular Thinking” conference, Gavin spoke to a number of the fair’s attendees, mainly comprised of experts in their field, and also manned the Full Grown area with the help of Alice, and the wonderful Jenny Dietel, or Dr Dietel as she is referred to. We’d like to thank Dr Sascha Peters for helping to organise such a brilliant event, to everybody who came up with such great questions during the event, and to everybody who made us all feel so welcome in Germany. We were particularly won over by Organoid Technologies, who recycle all sorts of organic matter into useful textiles and materials. They rightly won ‘Best of the Best’ at Interzum this year, so we definitely recommend checking them out for yourselves, here.